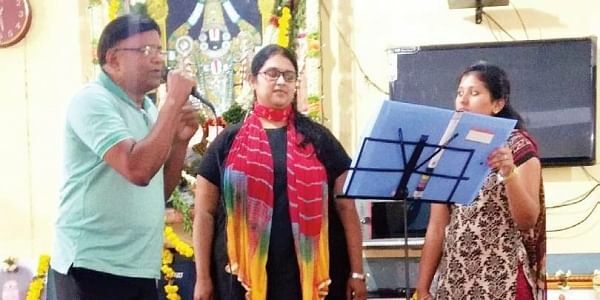 BENGALURU: Every Tuesday and Saturday, college students and amateur singers perform at Kidwai Institute of Oncology as part of a music therapy programme supported by a private foundation. Staff at this government-run hospital say that music has helped patients now respond better to treatment and are more cheerful. Started in August 2016, these sessons see participation from students of Christ University, SC PUC, Jyothi Nivas College, Dayananda Sagar College of Engineering and Amrita College and volunteers from the the general public. They are attended regularly by 20 to 30 children and about 50 adult patients, who look forward to spending time with the musicians. Only soft, soothing songs are played and volunteers refrain from using percussion instruments. Music therapy is being adopted across the world to help cancer patients. Research shows that it helps reduce stress, anxiety, pain and mood swings. This was brought to Kidwai by the Ashwin Maharaj Foundation (AMF). Established in December 2015, this foundation was started by Dr D Ramasubramanian, an anaesthesiologist, and his wife, R Manomani, in memory of their son R Ashwin Maharaj who they lost to Acute Myeloid Leukemia in October 2015. Ashwin was 23 at the time and was studying law at Jindal Global University. While undergoing treatment in San Diego, he had signed up for music therapy sessions and it helped alleviate his pain, improve sleep and reduce nausea and mood swings. Ashwin wanted to take music as a therapy for cancer patients across India as well, and his family and friends started AMF to make this vision a reality. Staff members at Kidwai say music betters the mental well-being of the patients. Dr K B Linge Gowda, Director, Kidwai Cancer Institute says, “Research shows that patients previously suffering from bouts of vomiting and nausea due to chemotherapy show a reduction in the after effects when given music therapy. In fact, there is a lesser need for administration of painkillers and they experience better sleep on these days.” Currently, this foundation conducts sessions in hospitals based in six cities – Chennai, Bengaluru, Ahmedabad, Coimbatore and New Delhi and will be starting sessions in JIPMER Medical College, Puducherry this June. Apart from music therapy, they also provide a high protein health mix powder that provides supplementary nutrition to patients. These health mix powder bottles are distributed every month at the Kidwai Institute. “They contain powdered almonds, flax seeds, black gram and other pulses and is used to make porridge. We are currently looking for support under Corporate Social Responsibility for the manufacturing of this powder,” said Manomani.